Vocalist/guitarist Jade Hanson, the older brother of PFR frontman Joel Hanson, put together Believable Picnic in Nashville with bassist Jason Burkham, a Minnesota native and PFR associate who relocated to Tennessee upon learning of the elder Hansons plans to form a pop-oriented, Christian guitar-rock act (similar to Kings X, with hints of the Beatles and Queen). They were eventually joined by keyboardist Nick Ayres and studio-only drummer Jeff Bridges, who elected not to tour in order to stay with his family. 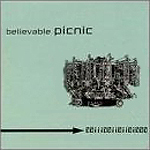 Believable Picnic debuted in 1996 on Absolute Records with a self-titled album, which produced successful singles in "Big Fat Nothing" and "Wasted." The follow-up, Welcome to the Future, appeared in 1998.